Virtual Tour: Following an animation of flying into Mineola with Chaminade front and center, users are able to direct themselves on a virtual tour, complete with descriptions of locations throughout the school and interactive 360-degree photographs. Events: On the Events & Lunch pages, students can find both general and athletic events and see what’s for lunch at the Courtyard Café up to a month in advance. News: The new app incorporates the news feeds from both the school website and Tarmac Online. With everything in one place, it is now easier to stay in the loop than ever before. 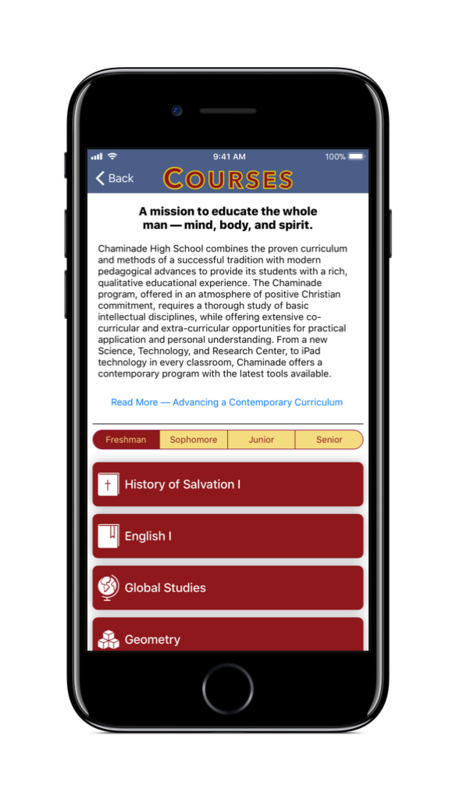 The Chaminade High School app is the culmination of Ryan’s programming experiences so far. 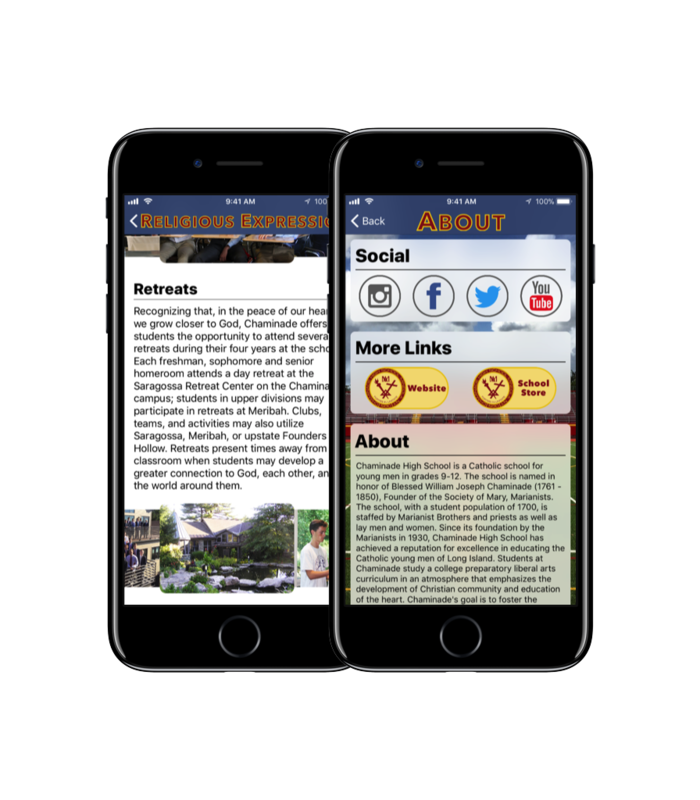 He has created an impressive app with an expansive list of features to be used by all members of the Chaminade family: students, teachers, parents, and alumni alike. The idea had been in the works since Ryan’s freshman year, but the majority of the progress occurred in the last six months, especially after he attended the WWDC this past spring. Athletics Activities: The Athletics page displays information and photos of all of Chaminade’s sports, filterable by season. The Activities page enables users to view the clubs and activities listings, rich in detailed descriptions and media. Religious Expression: The Religious Expression section details Chaminade’s involved spiritual activities and daily routines, including retreats and monthly school-wide masses. 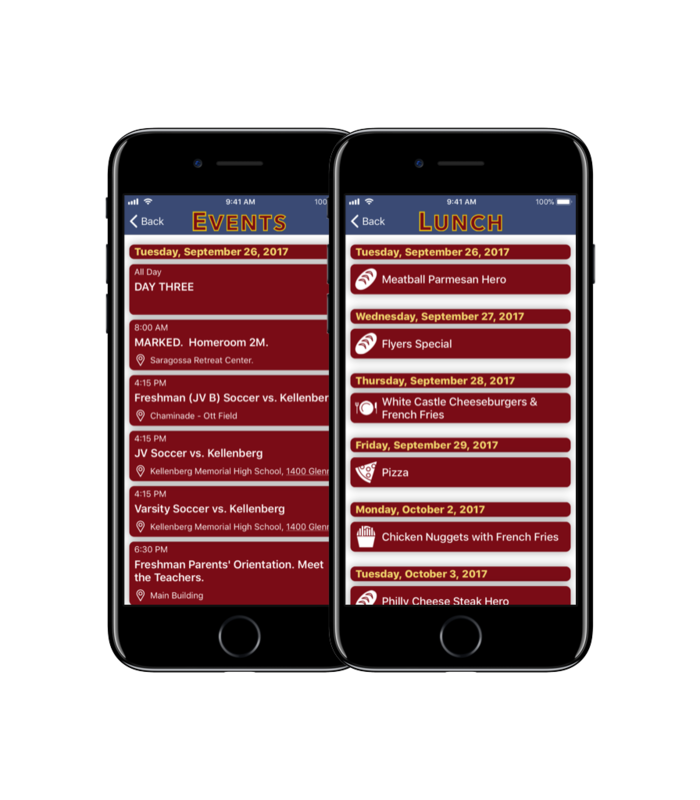 The first thing one will see upon launching the app will be the user-friendly menu, which provides the user with information about the day’s events, lunch, and the latest news. Beneath that, the Explore section allows users to learn more about Chaminade’s academics, athletics, and activities. Next, users can navigate to the Events list by tapping “See All” located next to the Events tab on the menu. This will immediately bring them a full list of all events, both general and athletic, for up to one month in advance. The same can be done for the Lunch list, which brings up a full month’s worth of lunch items. As far as news goes, one can navigate to the latest news article directly from the menu tab or to a full list of the twenty latest articles, uniquely blending both the school website’s news feed and Tarmac Online posts. Academics: The Academics feature includes information on the courses for all four years at Chaminade and allows students to contact their teachers with ease. By navigating to the Academics section, users can view a full list of courses for each year. By tapping on one of the seven main subjects, they can read more about the general department, and see a full list of teachers and their contact information. 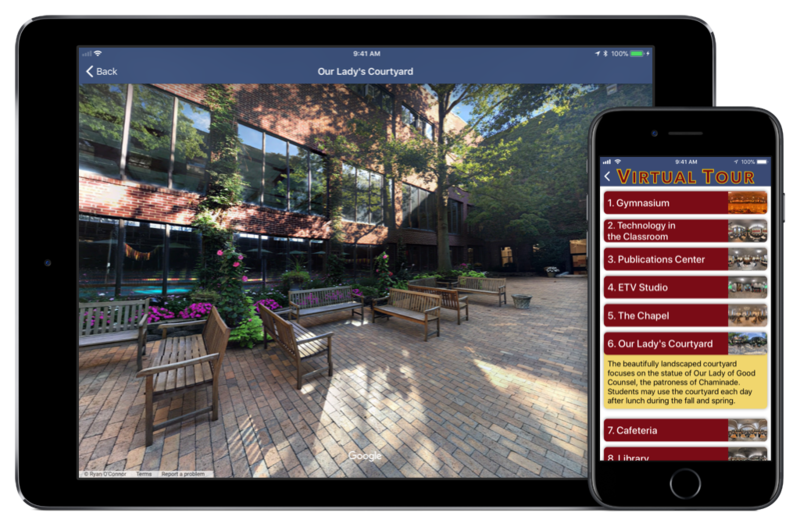 The Campus & Virtual Tour section provides users with an unparalleled experience: a full tour of Chaminade’s campus, right from their own device. 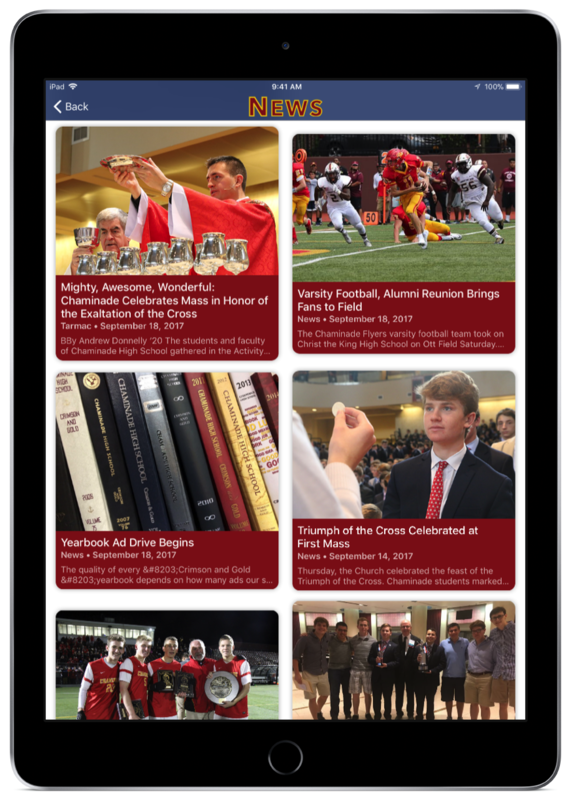 The Activities section contains a full listing of all the clubs and activities Chaminade has to offer, with nearly all of them featuring photos and/or videos. 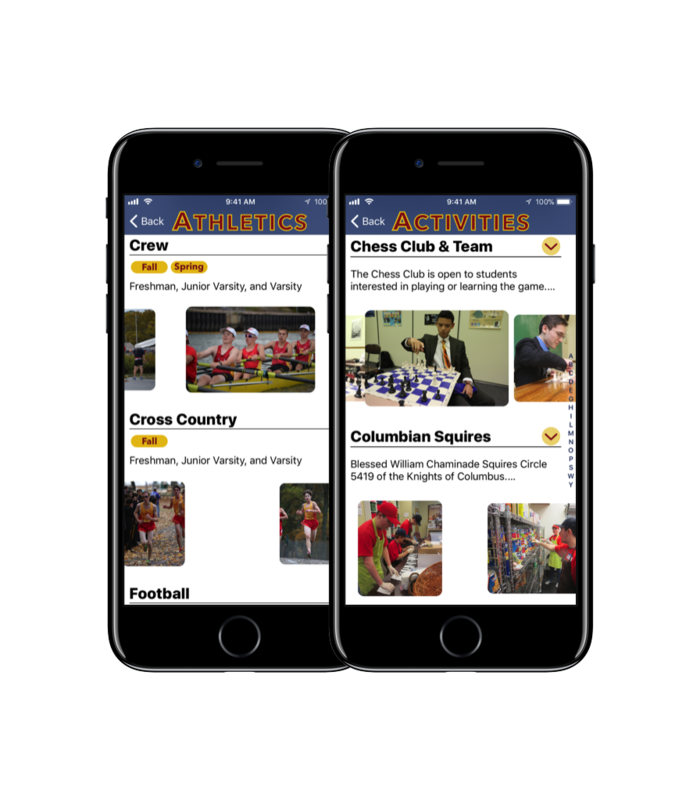 The Athletics page provides the user with a full view of the Chaminade athletics program, filtered by season, and pictures for a truly immersive experience. The core component of life at the school, religious expression, is featured on another tab in the app. Last but not least, the About Chaminade page provides additional information about the school and its history. It also gives easy-access links to the Chaminade website (www.chaminade-hs.org) and our online school store. The future is here, and it’s ready for download. Install the Chaminade High School app on your personal iOS devices today by clicking on the button below. Posted in News, Science & Technology and tagged app. Bookmark the permalink.